It really grinds my gears when I try to ask people at a makeup counter or a makeup artist how to contour my face and they write me off with a one step solution, or dont really have a solution at all…like overloading on highlighter or not knowing what kinds of blush to use to create the most contrast for darker skin. Well after a lot of experimentation I have come up with a fool proof routine that I use when I want to highlight and contour my face. I normally like a lot on contrast and this method provides a great balance of light and dark. Step 1: Take the lightest color in the Makeup Forever Cream Palette and apply it as a highlighter from under your eye to your cheek bone. Step 2: Apply your foundation on top to create a natural looking highlight. Step 3: Take the darkest color from the Makeup Forever palette and apply with the angled foundation brush under your cheek bone, parallel to your jaw line and blend with blending sponge. 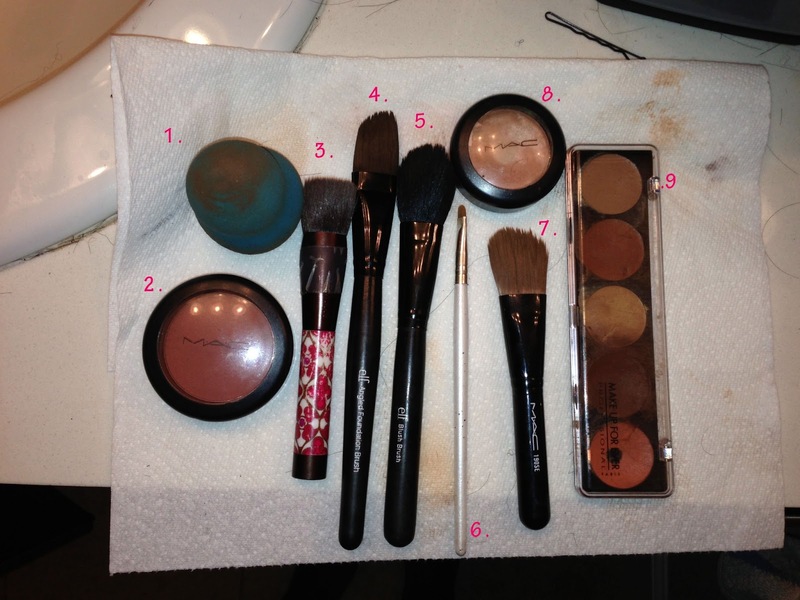 Step 4: Apply MAC Raizin Blush on top of your dark cream base to create an even greater contour. Blend as needed. For the very last step, use a multi purpose brush, or just your finger to lightly blend in the MAC Hush Cream Base on top of your highlight area for a slight sheen. And voila! A nicely contoured face. P.S. For a little extra contouring I apply a line of light colored Makeup Forever creme base in the middle of my nose and then use a darker color on the outsides and blend. What do you guys use to highlight & contour your face? im nigerian too : ) ..
And Hope the tutorial helps! I used to think highlighting and contouring wasn’t possible for my skin either but I finally came to a regular regimen through trial and error.